Audio Alchemy engineers set out to create the highest quality Preamp/DAC/Headphone Amp that could deliver exceptional, world-class sound for under $10,000. The result is the DDP-1 – a three-in-one powerful all-analog preamplifier, DSD-compatible digital-to-analog converter with dual digital signal processors and a headphone amp, all housed in one compact machined-aluminum chassis for under $2,000. Refine & Redefine Digital: Unlike most digital preamps and DACs, the DDP-1 employs sophisticated digital processing that gives it superior sound quality, dramatic noise reduction and flexibility. The ability to select from four output filter profiles and output resolutions means that you can get the most out of each digital file. Layered on top is Audio Alchemy’s world-renowned jitter control technology, which gives digital files that smooth, velvety analog quality we all love. Add the modular PS-5, a balanced power supply to maximize the DDP-1’s dynamic range and filtering to produce a rich sound that can compete with much larger and more expensive units. 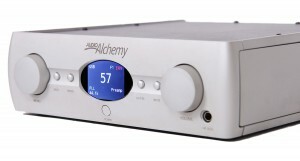 Sound Engineering: The digital section uses dual 32/216 PCM/DSD AKM DACs with seven digital inputs. Internal DSPs provide four output filter profiles and user-selectable output resolution. A proprietary DAC configuration raises dynamic range of digital signals by approximately 8 bits, and a multistage phase-locked loop reduces jitter to the picosecond level. The analog section provides discrete FET driver and output stages, a high-precision Alps volume control and XLR and RCA inputs and outputs. The DDP-1 and the PS-5 are designed to be integrated into a cohesive, elegant whole.